John Bibby was born on 18th May 1803 in Over Wyresdale to James and Betty Bibby. Over Wyresdale is a township within the parish of Lancaster; it is 7 miles south east of Lancaster. In 1851 the population was 860 (so in 1803 it would have been much less), it is now 348. Ward's Stone, 1,836 ft. above sea level, is the highest point. On the way back home from a staff conference when I worked for Lancashire County Council as a youth worker, on 24th April 1985, a colleague showed me the way back to my office in Clitheroe via the Trough of Bowland, an area of outstanding natural beauty. So we drove through Over Wyresdale. On the way back we stopped high up to admire Morecambe Bay and John pointing out Ward's Stone. This moment stands out in my memory partly because of the view and the incredible beauty of the trip, partly because of Ward's Stone, and partly with the added meaning that the following day my mother died. 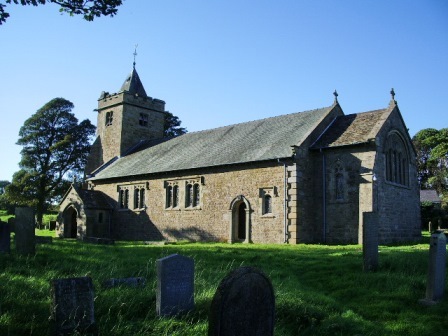 John Bibby was baptised on 26th June 1803 at Christ Church, Over Wyresdale, where his ancestors came from. John grew up with his three brothers, William, Joshua and Thomas, probably at Starbank, as this is identified as the abode on the baptism records of his older brother, William. Starbank is an area just north west of Dolphinholme where there is a Middle Starbank farm and also Starbank cottage. 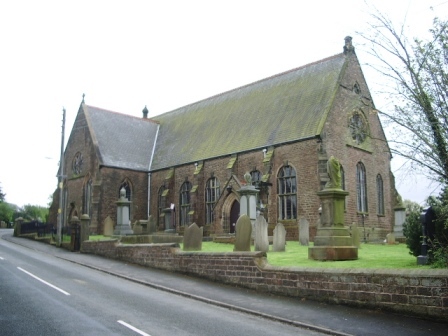 The next record we have is when John married Betty Satterthwaite on 23rd May 1825 at St Leonard in Walton-le-Dale. Why did he move, a distance of around 21 miles? John was a spinner. There was a worsted mill in Lower Dolphinholme which was built in 1795; similarly, there were four cotton mills in Walton-le-Dale. It might be, but seems unlikely, that John moved for work - unless he had been sacked? There were also Bibbys who lived in Samlesbury and the Walton-le-Dale area so there might have been family living there. Or maybe he left because of a misdeed? I say this because many years later (see below) he gets in trouble with the law and it seems he had been summonsed twice before - this suggests that John might have been a bit of a rebel. I can only find reference to two Satterthwaites in either Walton-le-Dale or Samlesbury and these were an Agnes, who was a widow, and died in 1811 and a Matilda who was 19 when she died in 1846. There are no other birth, marriage or burial records for Satterthwaites in this area. Nevertheless, this shows that there was at least one Satterthwaite family who lived here. The Satterthwaites originated from Satterthwaite/Hawkshead in the Lake District. Although according to the 1851 census, Betty Satterthwaite was born in Ulverston. I haven't traced her parents yet. 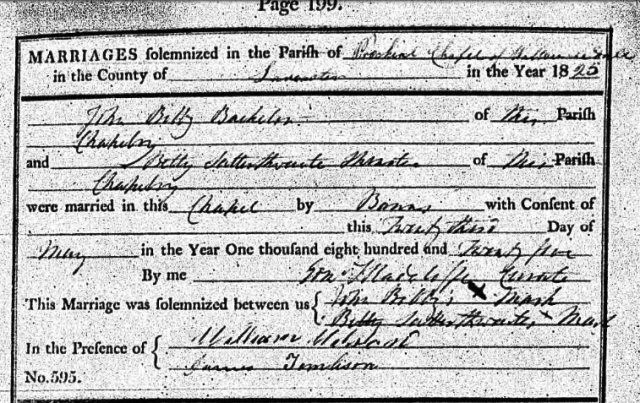 Richard (1825-1860) was born in Samlesbury; I cannot find any baptism record for him. However it is worth reminding ourselves that his parents got married in May 1825. Joshua (1826-1904) was born in Bashall Factory; he was baptised at St Leonard, Walton-le-Dale on 15th October 1826. The 'newly erected cotton mill in Walton-le-dale occupied by Wm.Bashall' was recorded in 1799. It was extremely remotely located, on the edge of the Farington Moss and fed by a mill-race flowing from the River Lostock. The mill is listed amongst those employing young children. 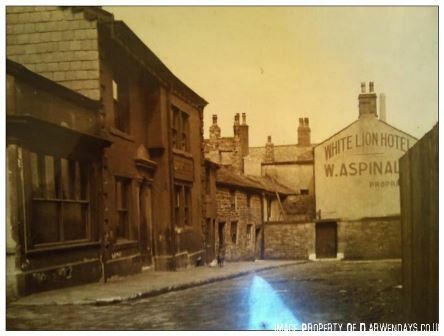 In 1821 the factory was valued at £219 per year, the mill estate had 50 cottages worth £140 in rents per year, a warehouse, a sizehouse, and Lostock House - a gentleman's residence. It was in short one of the most important of the early nineteenth century mills and the source of the great Bashall cotton fortune that built Farington mill. The mill has interesting links with all the crises, strikes, battles and famines endured by the early Lancashire cotton industry. In 1861 the mill was taken over by Henry Ward & Sons (hence 'Bashall's Row' was renamed 'Ward Street'- the area tragically bombed in 1940. ), and sold to Thomas Moss & Sons in 1888. The factory was extended in 1907 with the addition of a new weaving shed containing 1000 looms. Closed 1967-8. Mary ( 1828-?) was born on 12th November 1828 in Samlesbury; she was baptised at St Leonard the Lesser, Samlesbury on 7th December 1828. Hannah (1831-?) 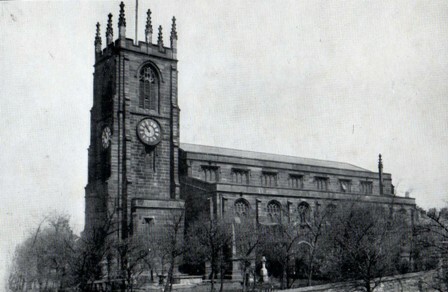 was born in Blackburn; she was baptised on 18th September 1831 at St Mary the Virgin, Blackburn. Nancy (1833-?) 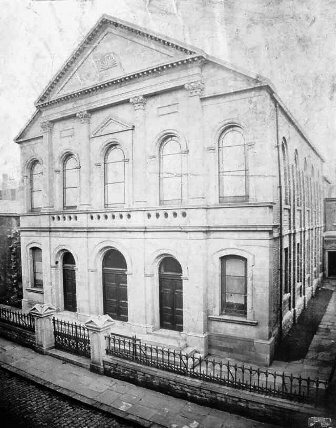 Blackburn; Nancy was baptised on 27th October 1833, at Clayton Street Chapel. Sarah (1837-?) Blackburn; she was born 31 January 1837 and baptised at St Paul, Blackburn on 26th February 1837. George (1839-?) Wheelton; he was baptised on 3rd March 1839 at the Chapelry in Heapey. 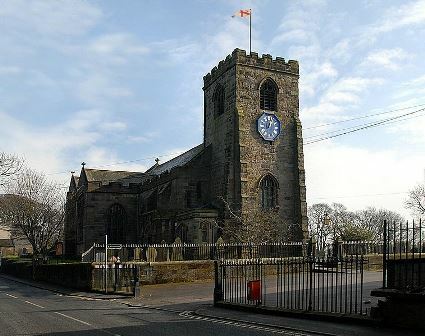 Heapey is a village two miles from Chorley. Joseph (1841-?) Blackburn; he was born in Livesey, I don't have any baptism record for him but on the Lancashire BDMs it says his mother's maiden name was "Saterseth". Margaret (1843-1844) Darwen; Margaret was born at Pickup Bank and baptised at Holy Trinity on 25th June 1843. The BDMs have her mother's maiden name as "Satterforth". Thomas (1845-1846) Darwen; was born in Over Darwen and baptised at Holy Trinity on 2nd March 1845. The BDMs have his mother's maiden name as "Sathuset". John (1846-1902) Darwen; he was baptised at Holy Trinity on 17th June 1846. His mother's maiden name is down as "Satathet". William (1847-?) Darwen; baptised at Holy Trinity on 13th October 1847. On the BDMs his mother's maiden name is "Sathather." Now seems like a good time to explain how I came to find Richard Bibby's parents. I had been searching for several years and could not find where Richard came from. 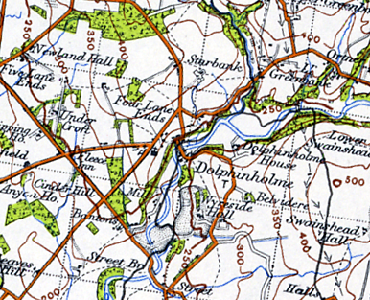 The 1851 census tells us that Richard was born in Samlesbury. His marriage certificate (1845) tells us that his father was John Bibby, a publican. I wonder what the two previous offences had been? The first four children are usually baptised with the names of the parents' parents. So I deduced that John's wife may have been called Betty or Betsy. Using this information I did a grand search on the Parish Records for John Bibby with a spouse who's name was Betty. I came up with a John Bibby who married a Betty Satterthwaite at St Leonard in Walton-le-Dale on 23rd May 1825. I then did a search for births with the names John Bibby and Betty in the Parish Records and came up with a long list, the first child in the records was Joshua and he was born in Bashall Factory, Walton-le-Dale and baptised at St Leonard in 1826; their second child, Mary, was born in 1828 and the family lived in Samlesbury, they then moved to Blackburn where most of the children were born. Over the past few years Lancashire Archives have been adding new data to the BDMs, in particular the previous surname of the mother in the births section - this has given me a few breakthroughs recently. As can be seen from the details above, all of those with records from Lancashire BDMs had a surname that looked very much like Satterthwaite. I am not too bothered that they are all spelt differently but they are strange enough, for me at least, to suggest they all have the same parents. 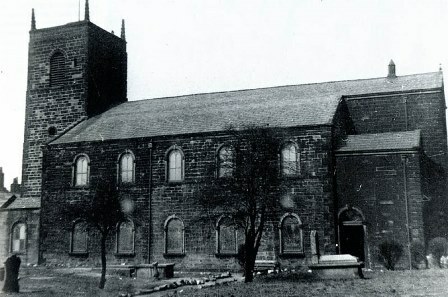 The Bibby family end up in Darwen where their son, Thomas, was born in 1845 and was baptised at Holy Trinity. His father, John Bibby, was an Inn Keeper. This is the same year that Richard married Martha Barnes and the marriage certificate tells us John Bibby, Richard's father, was a publican. This clinches it for me. 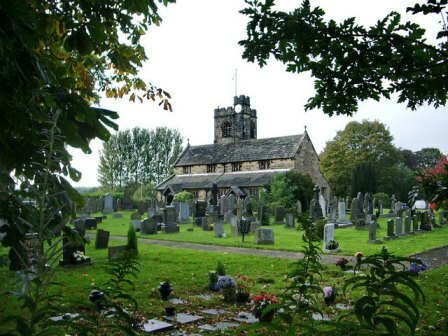 James died at 10 weeks; his burial took place at St Mary the Virgin, Blackburn, on 14th February 1836. The 1851 census has John and his wife and family living in Back Richard Street in Blackburn. John is 48 and it looks like he has given up being a publican (1845?-1848?) and gone back to being a spinner, which is his occupation on the majority of the baptismal records. Betty is 47. The four eldest children, Richard, Joshua, Mary and Hannah had all left home and got married. Nancy is 17 and a warper; Sarah is 14 and a weaver; George is 12 and a tenter; John is 5 and Mary 3. I have looked through the records for Mary and it seems likely she is Nancy's illegitimate daughter or another grand-child of Betty and John. John Bibby dies from bronchitis at the age of 52 on 4th October 1855. He is living at 41 Pendle Street, Blackburn, his wife, Elizabeth Bibby, signed as the informant with an 'x' who was with him when he died. The death certificate states that he was a cotton spinner. I have been unable to trace Betty any further. Richard (1825-1860) is my great, great, grandfather.